In the morning we took a bus back to where the animals had been high-lined overnight, and tacked up and prepared for our first Catalina trail adventure. Difficulty: Easy. Mostly traveling on the road, jeep worthy, and the only real hazard being the wild bison who live freely on the island and added an element of danger and thrill to the stroll. 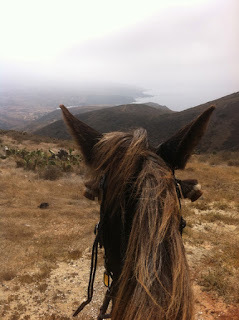 Tobe had had enough of standing around, we were both ready to begin to see the secret interior of Santa Catalina Island. 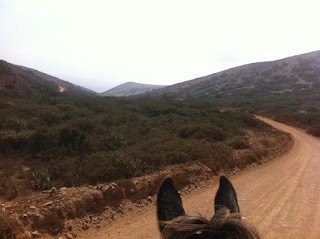 On my numerous previous visits I had only explored the area around Avalon, but now with the help of my surefooted steed I was going to be able to explore the REAL island, the part that the Wrigley family fell in love with and then deeded over to the Conservancy so that it can remain wild and free forever. 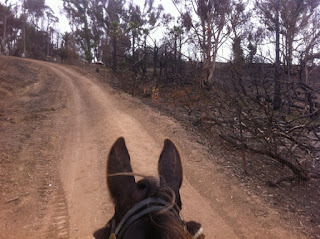 The first part of the track to Little Harbor had recently burned, an eerie landscape to pass through. On the first climb two horses threw shoes and had to turn back to get boots fitted. Tobe was wearing shoes on all 4 hooves for the first time since I've had him, as required by the organizers of the ride. 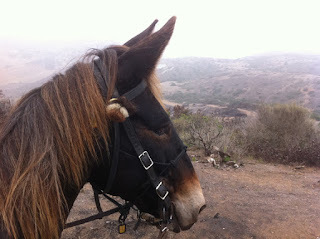 Since there are no boots made for mules he had metal shoes, and I said a big prayer that they'd stay firmly on for the whole week and not cause problems. Looking back through the burnt trees at Cat Harbor, where the barge transporting the animals came in. Looking back, the beautiful calm Cat harbor. 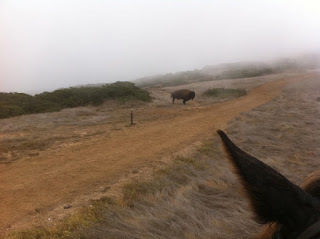 Then, holy moley, there was our first sighting of a bison. 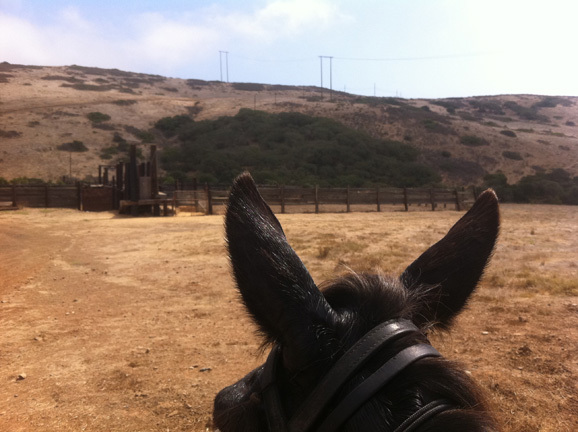 No wonder Tobe didn't want to turn around and take another harbor photo. I swear they look as big as a truck. Wikipedia says that can grow to 11.5' long and weigh up to 2,800 pounds. That's double the size of Tobe, who is a very big animal. In typical mule mode he kept his gaze firmly focused on the big unknown. 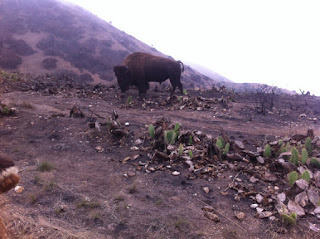 I was afraid when viewing these pictures in my iPhone that the bison couldn't possibly look as BIG as they really are. When it flicked its ears Tobe did do a sidestep into some of that opuntia cactus you see growing there, and we had to stop and pluck out the spines. I don't know that he'd ever had cactus spines stuck in him before, but he's a quick learner and never did that again. 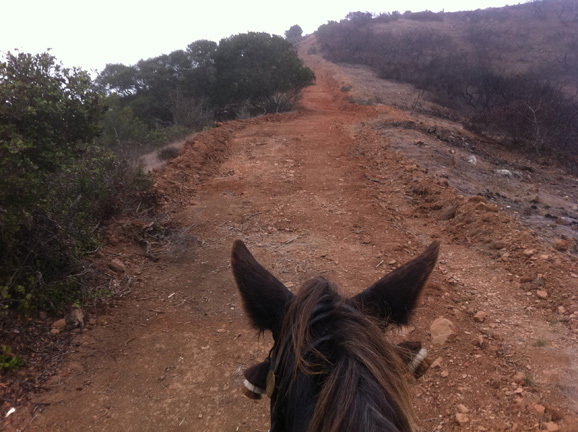 As long as I never fall in any, I'm OK with whatever evasive maneuver he thinks necessary in the face of danger. Some of the other riders actually turned back. 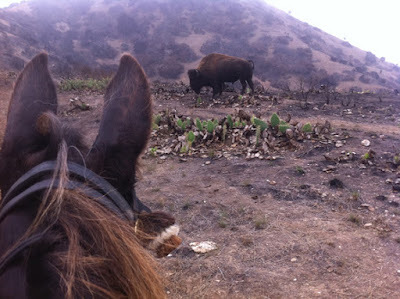 Seemed to me like the gals transmitted so much of their own fear of the bison to their horses that they felt like they couldn't possibly ride past it. I don't know what they ever did, presumably someone more confident escorted them to camp because later we all got there. 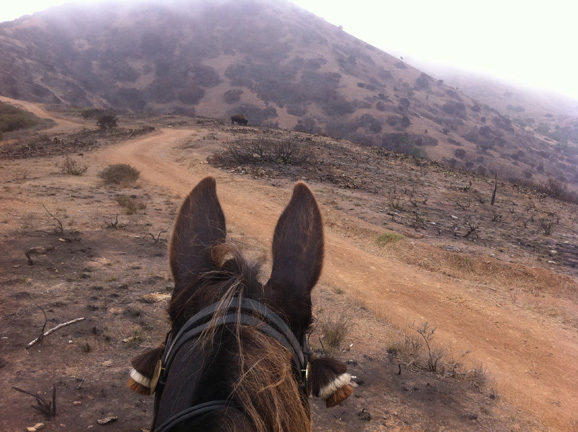 We started to do the Trans-Catalina trail but rode up into fog so thick we had no view at all. 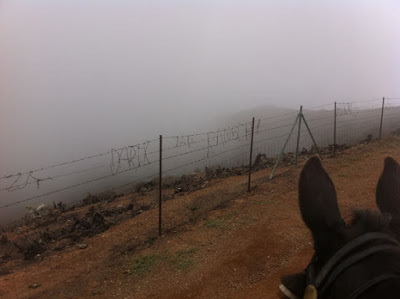 This fence had something I've never seen before, barbed wire graffiti. 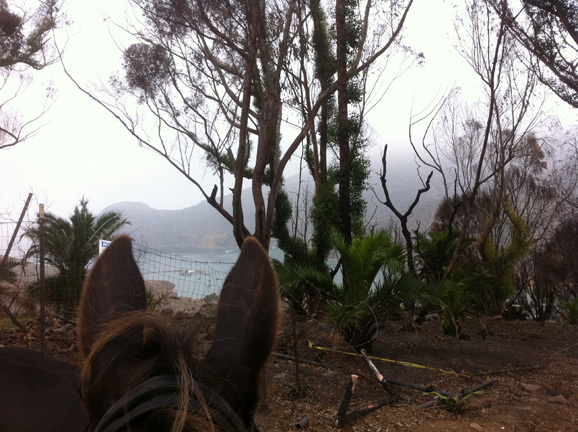 Eventually we reconsidered, thinking why cling to cliff edge trails if you can't even see the drop off to the sea. So we changed course and went another way that would take us on an inland route to camp, vowing to do the Trans-Cat later during our stay. 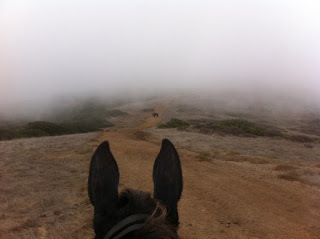 Mist and fog and exploring a new landscape with new friends. Doesn't get much better than that. Except oh no, there's another bison! As Wikipedia describes: "The heads and forequarters are massive, and both sexes have short, curved horns that can grow up to 2 feet (61 cm) long, which they use in fighting for status within the herd and for defense." We did a two-step and a quick pass by and the bison just stared us down and made no aggressive move. I just tried to breathe evenly and NOT transmit any tension to Tobe through my legs. 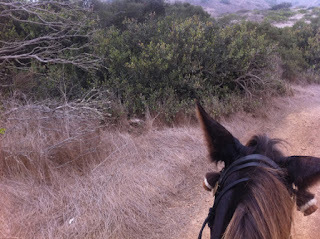 Much of the island is laced with old fences, which might at one point have seemed as if they could contain the bison. Clearly from the condition of them that was not an adequate assessment. 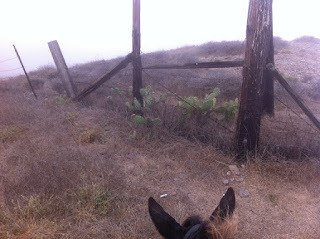 Now the cactus growing in them is probably more of a deterrent than the century-old barbed wire. This is a buffalo pen. Every two years the bison are rounded up, checked for diseases, treated if necessary, and a percentage of them are culled out and shipped to a Native American tribe in North Dakota to add to a herd there. The ones breeding on the island have been a pure isolated population for so many generations, never interbreeding with cattle, that they are considered a genetically pure and valuable strain. Presumably the bison burgers served at the island cafes are imported from elsewhere. 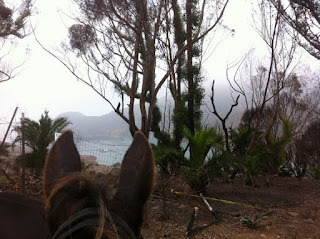 A change in the light and air heralded the coastline ahead. 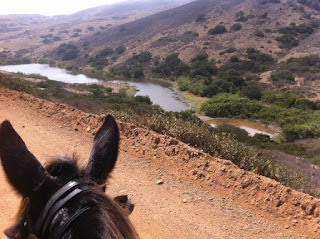 A reservoir lagoon in a valley was a pretty sight. 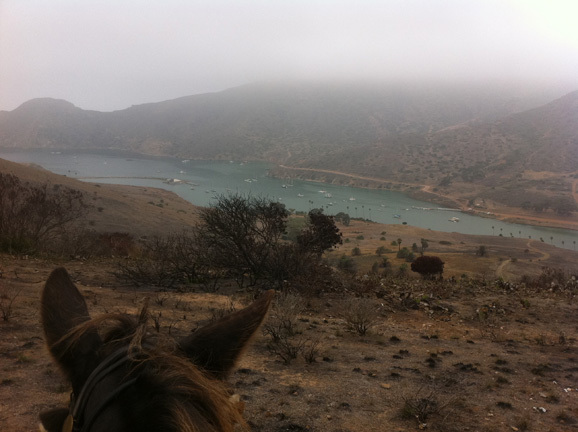 And then, topping a last ridge, we see our campground, Little Harbor. 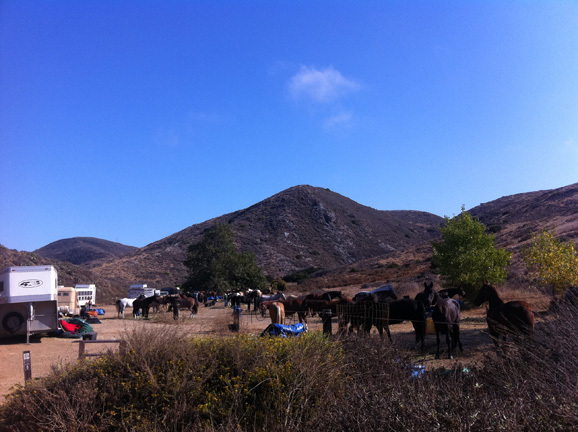 And here is Tobe's campsite, high-lined with all the horses, getting fed as much as he wanted and relaxing after a nice walk.